The logo for the Cape Ann Chamber of Commerce license plate will be used for the Cape Ann Cultural District mobile application, launched May 2014. 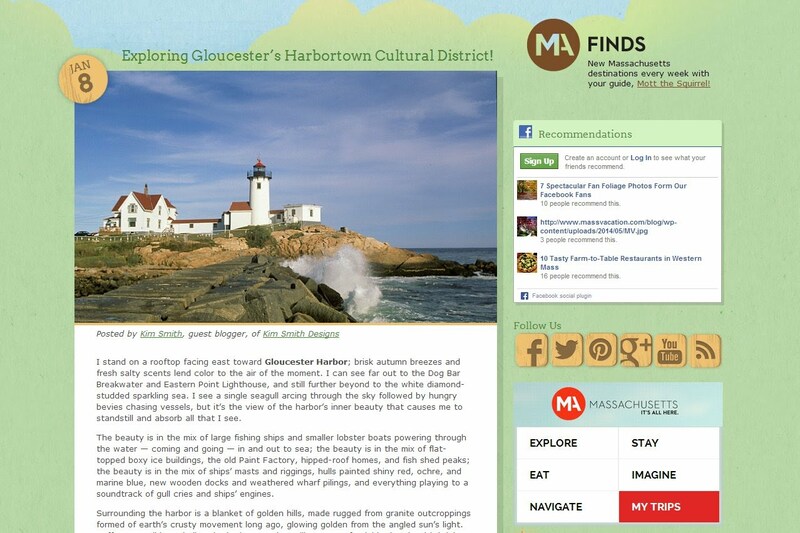 JANUARY 2014 Great article about Gloucester's Harbortown Cultural District for Massachusetts Office of Travel and Tourism by Kim Smith. This piece is part one (highlighting fall and winter) of a two part series about Gloucester's Harbortown Cultural District. Part two showcases events that take place during the spring and summer, for example, the Feast of St. Joseph, St. Peter’s Fiesta, and the Schooner Festival. NOVEMBER 2013 Harbortown Cultural District is featured in an issue of AAA's publication Horizons as part of a submission for one of its regularly published “ten” lists. They introduce the ten districts as “the creative heart of many communities. Here are some in the region worth visiting.” The other districts on the list cover 7 states: New Haven’s Audubon Arts District, Philadelphia’s Avenue of the Arts, Lowell’s Canalway, New York City’s East Fourth Street, Providence’s Downtown, Hartford’s Downtown, Baltimore’s Mount Vernon, Portland’s Arts, and Pittsfield’s Upstreet. The article also credits the Massachusetts Cultural Council’s (MCC) cultural districts program. The author mentioned selecting this district because of the HarborWalk. MCC Press Release:Big increase in State Funding for Cultural Facilities: Anita Walker, Executive Director of the Massachusetts Cultural council sent the Cultural Districts this exciting announcement of $15 million for Cultural Facilities Fund in 2014. She writes, “You’ve most likely heard the terrific news by now - Governor Patrick today announced his decision to triple the state’s investment in the Massachusetts Cultural Facilities Fund (CFF) with an allocation of $15 million for FY14. 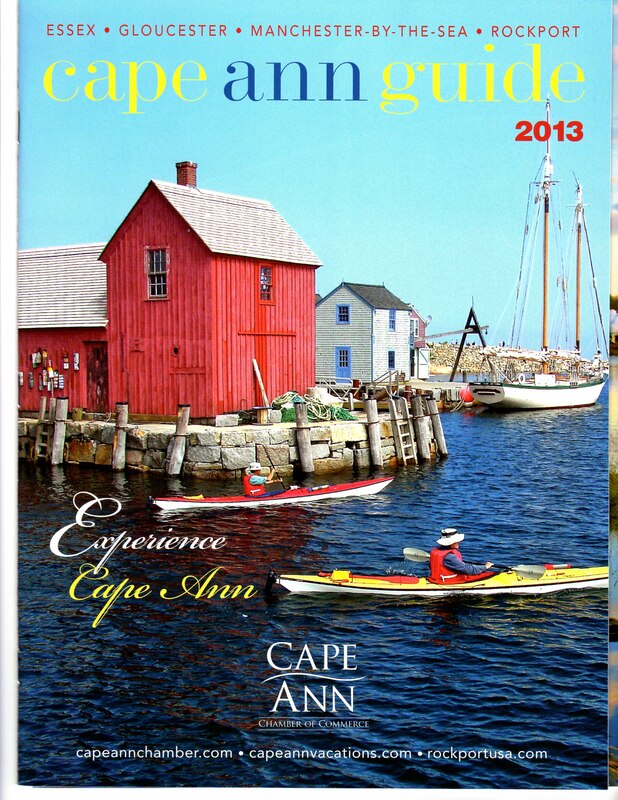 October 2013 Harbortown press release for the CAPE ANN CULTURAL DISTRICTS APP Thanks to the talented partners within all our districts! Cape Ann, MASS- The City of Gloucester and the towns of Essex and Rockport today announced the development of a Mobile Application. Now Cape Ann visitors and residents can explore the area’s cultural districts through the new mobile app which is expected to launch in late fall. The mobile app is funded in part through an Adams Art Grant from the Massachusetts Cultural Council. The bulk of the matching funds will be provided by the City of Gloucester, through the Office of Mayor Carolyn Kirk and by partner organizations and municipalities...Success with obtaining the grant was made possible by the dedicated efforts from: City of Gloucester, through the Office of Mayor Carolyn Kirk; Town of Essex; Town of Rockport, Economic Development Committee; Gloucester’s Harbortown Cultural District; Gloucester’s Rocky Neck Cultural District; Essex River Cultural District; Rockport Cultural District; Society for the Encouragement of the Arts (seARTS); and the Cape Ann Chamber of Commerce! PART 1: The first of two articles focused on the Massachusetts Cultural Council's growing cultural district initiative. In this first part, we examine the four separate districts on Cape Ann (of the 17 statewide districts). Next week, in part two, a look at some of the challenges facing Cape Ann's districts, with an investigation of intiatives in Hyannis and in Boston, as well as a look at similar program in Maryland which was begun more than a decade ago. photo caption:"In her remarks at the Harbortown reception, the MCC's Anita Walker noted that the statue of Fitz Henry Lane painting the boats in Gloucester Harbor symbolizes the interdependence of the city's arts community and its fishing heritage" Business owners Joey Ciaramitaro(Good Morning Gloucester) and Lenny Linquata and other partners spoke to this theme at Fred Bodin's on the site visit.